Among the committee updates were a report from Adam Doerr, co-Chair of CLE who informed the council that preliminary feedback indicated that the CLE presented on Feb. 9, 2017 on “HB-2” had received quite favorable ratings and, according to the early numbers, was well attended. Eric David, chair of our Constitution Day/Education/Pro Bono Committee, in furtherance of one of the principal purposes of our section to promote civic awareness of our Constitution, reported that a number of North Carolina cities adopted a proclamation last September on Constitution Day and Citizenship Day Constitution Week 2016. 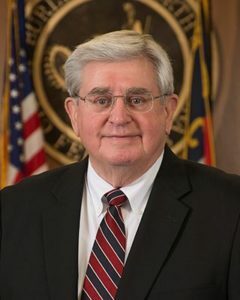 He also indicated that the committee was in the process of surveying a sample of North Carolina School Superintendents regarding the book, “Constitutional Law for Kids.” The principal goal is to gather information to determine the suitability and usefulness of this book as a potential resource as a learning aid for our members when making presentations for school age children. Treasurer Patricia Perkins reviewed the section’s current financial status which revealed that there would be a potential budget surplus at the end of the current fiscal year (June 30, 2017). A discussion ensued regarding the use of any budget surplus for 2017. The council unanimously voted to authorize transfer of any budget surplus to LRE for use in its program. To wrap up this year, I would like to simply say that it has been my honor and privilege to serve as chair of the Constitutional Rights and Responsibilities Section. Also, I would like to express my sincere gratitude to the council members, committee chairs, Andi Bradford, Coleta Bell and all the other staff members of the NCBA for their invaluable support and outstanding cooperation over the course of this year. One final note: Our section will be in great hands under the leadership of Chair Michele Luecking-Sunman, who I wish the very best as she embarks on her tenure 2017-2018. Chair’s Comments: 2017-18 Officers Elected, Walter E. Dellinger III Honored,... Incentive Support For Retail Projects: Yes Or No?